An action cRPG based on a German pen&paper RPG system – Das Schwarze Auge. The developers from Silver Style Studios drew the inspirations for their game from the iconic Diablo series. The Dark Eye: Demonicon is another, after Drakensang, game that was based on an extremely popular, especially in German-speaking countries, paper role-playing system Das Schwarze Auge. The game in question, developed by Silver Style Studios, should appeal to Diablo fans, especially since its creators do not hide drawing inspiration from the cult video game from Blizzard Entertainment Studios. The character whose role you take in Demonicon has no easy life. His adoptive father is accused of attempted murder of the hero’s beloved Calandra, a daughter of a wealthy alchemist, and is banished from the kingdom. Is it the truth, though, or was he slandered by an envious neighbor? Or maybe the conspiracy goes even deeper? The protagonist decides to unravel the mystery, but it is not easy, especially because everything happens near the border of the Black Lands, a habitat of evil, and his only friend seems to be a mysterious elf named Rynn. The pathway to unraveling the truth leads through the most dangerous areas of Aventuria, places full of enemies, covered in the dark, and full of not-always-pleasant surprises. You also encounter quite exotic characters – mad men, desperates, etc. – it is up to you, however, whom you trust, and who gets to become your friend or foe. The decisions you make have an impact on the events in the whole world. However, you have to choose very carefully – the Black Lands do not forgive mistakes. The world that you explore in Demonicon has been prepared in great detail, with care of faithfulness to the paper prototype of the game. The developers from Silver Style also introduced a number of elements that make the world of Aventuri alive – thus, there is a day-night cycle, residents have their daily schedule, taverns get filled with people in the evenings, and monsters creep out to hunt at night. The main story is enriched by a number of side quests that can be solved in different ways. As it happens in RPG’s, at the beginning of the game you can freely customize your character and adjust their race, personality, appearance, or specializations and skills to your play style - all based on the rules of Das Schwarze Auge system. 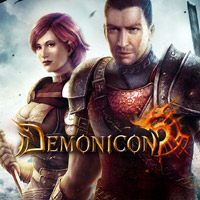 One of the strong points of The Dark Eye: Demonicon is multiplayer mode – you can enjoy the game in a team of up to 8 people, and some specific quests are only available for teams.